William Butler Yeats (June 13, 1865 – January 28, 1939) was an Irish poet, dramatist, mystic, and public figure. He is considered among the most influential figures in early twentieth-century English verse and regarded by some critics as among the greatest poets in the English language. Yeats came to maturity at the beginning of the twentieth century and his poetry marks a transition from late Victorian to modernist themes. Yeats is noteworthy as a master of traditional poetic forms while recognized as one of the greatest exponents of modernist verse. As a youth he was influenced by aestheticism and Pre-Raphaelite art, as well as the French Symbolist poets. He admired the English poet William Blake and developed a lifelong interest in mysticism. From early life he associated poetry with religious insights and thought poetry the best means of examining the "powerful and benevolent" sources of human destiny. Yeats idiosyncratic mystical perspective drew on Hinduism, Theosophy and Hermeticism often more than Christianity, and in some instances these allusions make his poetry difficult to grasp. Yeats was a key figure in the Irish Cultural Revival and sought in his early verse to reawaken Ireland to its ancient literature. Yeats sometimes addressed political themes, and his involvement in Irish public affairs led to his election to the Irish Senate in 1922. Yeats’ poetic style evolved through phases and late in life he was ranked along with Ezra Pound and T. S. Eliot, as foremost modernist poets. Yeats revitalized rhymed-and-metered poetry at a time when it was in serious danger of becoming stagnant. Like Robert Frost in America and Thomas Hardy in England, Yeats found a way to write with a voice that was refreshingly new and colloquial, while at the same time utilizing the devices of poetic form to their utmost potential. In his later years Yeats revitalized poetry yet again with the help of Ezra Pound, pointing towards an entirely new direction, and doing so with poems that are not only provocative and inventive, but also hypnotically beautiful. Yeats was awarded the Nobel Prize for Literature in 1923. When Yeats was young, his family moved first from Sandymount, County Dublin, to County Sligo, and then to London to enable his father John to further his career as an artist. At first, the Yeats children were educated at home. Their mother, who yearned for home in County Sligo, entertained them with stories and folktales from her native county. In October 1881, Yeats resumed his education at the Erasmus Smith High School in Dublin. His father's studio was located nearby and he spent a great deal of time there, meeting many of the city's artists and writers. He remained at the high school until December 1883. Even before he began to write poetry, Yeats had come to associate poetry with religious ideas and thoughts of sentimental elements. Describing his childhood in later years, he described his "one unshakable belief" as "whatever of philosophy has been made poetry is alone… I thought… that if a powerful and benevolent spirit has shaped the destiny of this world, we can better discover that destiny from the words that have gathered up the heart's desire of the world." Yeats' early poetry drew heavily on Irish myths and folklore. It also drew upon the diction and coloring of pre-Raphaelite verse. His major influence in these years—and probably throughout the rest of his career as well—was Percy Bysshe Shelley. In a late essay on Shelley he wrote, "I have re-read Prometheus Unbound… and it seems to me to have an even more certain place than I had thought among the sacred books of the world." Yeats' first significant poem was "The Isle of Statues," a fantasy work that took Edmund Spenser's work for its poetic model. It appeared in Dublin University Review and was never re-published. His first book publication, one hundred copies paid for by his father, was the pamphlet Mosada: A Dramatic Poem (1886), which had already appeared in the same journal. The Wanderings of Oisin and Other Poems followed in 1889. The long title poem, the first that he would not disown in his maturity, was based on the poems of the Fenian Cycle of Irish mythology. This poem, which took him two years to complete, shows the influence of Ferguson and the Pre-Raphaelites. It introduced what was to become one of his most important themes: the appeal of the life of contemplation vs. the appeal of the life of action. After "The Wanderings of Oisin," he never attempted another long poem. His other early poems are lyrics on the themes of love or mystical and esoteric subjects. The Yeats family had returned to London in 1887, and in 1890 Yeats co-founded the Rhymer's Club with Ernest Rhys. This group of like-minded poets met regularly and published anthologies in 1892 and 1894. Other early collections include Poems (1895), The Secret Rose (1897) and The Wind Among the Reeds (1899). In 1889, Yeats met Maud Gonne, a young heiress who was beginning to devote herself to the Irish nationalist movement. Gonne admired Yeats' early poem The Isle of Statues and sought out his acquaintance. Yeats developed an obsession for Gonne, and she was to have a significant effect on his poetry and his life thereafter. Two years after their initial meeting, Yeats proposed to her, but was rejected. He proposed to Gonne a total of three more times: in 1899, 1900 and 1901. With each proposal, she rejected Yeats and finally, in 1903, married the Roman Catholic Irish nationalist John MacBride. This same year Yeats left for an extended stay in America on a lecture tour. His only other affair during this period was with Olivia Shakespear, whom he met in 1896 and parted with one year later. Also in 1896, he was introduced to Lady Gregory by their mutual friend Edward Martyn. She encouraged Yeats' nationalism and convinced him to continue focusing on writing drama. Although he was influenced by French Symbolism, Yeats consciously focused on an identifiably Irish content and this inclination was reinforced by his involvement with a new generation of younger and emerging Irish authors. Together with Lady Gregory, Martyn and other writers including John Millington Synge, Sean O'Casey, and Padraic Colum, Yeats was one of those responsible for the establishment of the literary movement known as the “Irish Literary Revival” (otherwise known as the “Celtic Revival”). 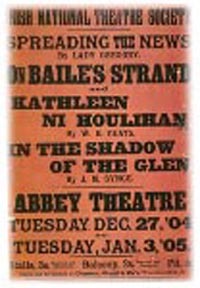 One of the enduring achievements of the Revival was the setting up of the Abbey Theatre. In 1899 Yeats, Lady Gregory, Martyn and George Moore founded the Irish Literary Theatre. This survived for about two years but was not successful. However, working together with William and Frank Fay, two Irish brothers with theatrical experience, and Yeats' unpaid-yet-independently wealthy secretary Annie Elizabeth Fredericka Horniman (an English woman who had previously been involved in the presentation of George Bernard Shaw's Arms and the Man in London in 1894) the group established the Irish National Theatre Society. This group of founders was also able, along with J. M. Synge, to acquire property in Dublin and open the Abbey Theatre on December 27, 1904. Yeats' play Cathleen Ni Houlihan and Lady Gregory's Spreading the News were featured on the opening night. Yeats continued to be involved with the Abbey up to his death, both as a member of the board and a prolific playwright. In 1902, Yeats helped set up the Dun Emer Press to publish work by writers associated with the Revival. This became the Cuala Press in 1904. From then until its closure in 1946, the press, which was run by the poet's sisters, produced over 70 titles, including 48 books by Yeats himself. Yeats spent the summer of 1917 with Maud Gonne, and proposed to Gonne's daughter, Iseult, but was rejected. In September he proposed to Georgie Hyde-Lees, was accepted, and the two were married on October 20. Their marriage was successful, though she was 26 and he was 52 at the time. Around this time he also bought Ballylee Castle, near Coole Park, and promptly renamed it Thoor Ballylee. It was his summer home for much of the rest of his life. Yeats had a life-long interest in mysticism, spiritualism, and astrology. In 1885, he and his friends formed the Dublin Hermetic Order. This society held its first meeting on June 16, with Yeats as the chair. The same year, the Dublin Theosophical lodge was opened with the involvement of Brahmin Mohini Chatterjee. Yeats attended his first séance the following year. Later, Yeats became heavily involved with hermeticist and theosophical beliefs, and in 1900 he became head of the Hermetic Order of the Golden Dawn, which he had joined in 1889. After his marriage, he and his wife dabbled with a form of automatic writing, Mrs. Yeats contacting a spirit guide she called "Leo Africanus." Yeats' mystical inclinations, was informed by Hindu religion. Yeats translated The Ten Principal Upanishads (1938) with Shri Purohit Swami. Theosophical beliefs and the occult formed much of the basis of his later poetry, which some critics attacked as lacking intellectual or philosophical insights. In 1913, Yeats met American poet Ezra Pound. Pound traveled to London to meet the older man, whom he considered "the only poet worthy of serious study." From that year until 1916, the two men wintered in the Stone Cottage at Ashdown Forest, with Pound nominally acting as Yeats' secretary. The relationship got off to a rocky start when Pound arranged for the publication of some of Yeats' verse in the magazine Poetry with Pound's own unauthorized alterations. These changes reflected Pound's distaste for Victorian poesy, a style for which Yeats, as a poet born late into the Victorian era, was partially responsible. Pound, like Yeats himself, had once been enamored with the Victorian poets, particularly Algernon Swinburne and Dante Gabriel Rossetti. Yeats' early style is considered to be an apotheosis of the late Victorian tradition. Yeats, however, like Pound, had grown dissatisfied with the aridity of the Victorian style, which, as Yeats moved into middle age, had grown stale and hollow, full of allusions and symbols with no animating purpose. During their time together, Pound's influence, and particularly their joint research into the form of Japanese Noh plays, translations of which Pound had obtained from Ernest Fenollosa's widow, would prove revolutionary. They provided Yeats with an exemplar for an attenuated style in his plays, which would go on to influence the pithy, mature poems of his late career. The first of Yeats' "modern" plays modeled on Noh was At the Hawk's Well, the first draft of which he dictated to Pound in January 1916. Yeats is generally considered to be one of the twentieth century's key English language poets. Yet, unlike most modernists who experimented with free verse, Yeats was a master of the traditional verse forms, and he would have been immortalized as a master poet even if he had never lived to meet Pound or join the modernist movement. However, many critics agree that Yeats' greatest contribution to poetry would only emerge in his late career, when he had become a thoroughly modern old man. The impact of modernism on Yeats' work can be seen in the increasing abandonment of the more conventionally poetic diction of his early work in favor of the more austere language and more direct approach to his themes that increasingly characterizes the poetry and plays of his middle period, comprising the volumes In the Seven Woods, Responsibilities, and The Green Helmet. The poetry of Yeats' middle period moved away from the Celtic Twilight mood of the earlier work. His political concerns moved away from cultural politics. In his early work, Yeats' aristocratic pose led to an idealization of the Irish peasant and a willingness to ignore poverty and suffering. However, the emergence of a revolutionary movement from the ranks of the urban Catholic lower-middle class made him reassess his attitudes. Yeats' new direct engagement with politics can be seen in the poem "September 1913," with its well-known refrain "Romantic Ireland's dead and gone,/It's with O'Leary in the grave." This poem is an attack on the Dublin employers who were involved in the famous 1913 lockout of workers supporting James Larkin's attempts to organize the Irish labor movement. In "Easter 1916," with its equally famous refrain "All changed, changed utterly:/A terrible beauty is born," Yeats faced his own failure to recognize the merits of the leaders of the Easter Rising because of their humble backgrounds and lives. Yeats was appointed to the Irish Senate (Seanad Éireann) in 1922. One of his main achievements as a senator was to chair the coinage committee that was charged with selecting a set of designs for the first coinage for the Irish Free State and the costumes of Irish judges. He also spoke against proposed anti-divorce legislation in 1925. His own characterization of himself as a public figure is captured in the line, "A sixty-year-old smiling public man" in the 1927 poem "Among School Children." He retired from the Seanad in 1928 due to poor health. During his time as a senator Yeats warned his colleagues, "If you show that this country, southern Ireland, is going to be governed by Roman Catholic ideas and by Catholic ideas alone, you will never get the North … You will put a wedge in the midst of this nation." As his fellow senators were virtually all Catholics, they were offended by these comments. 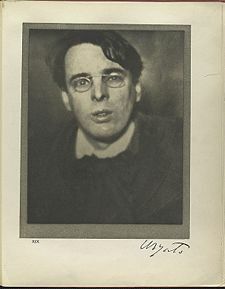 Yeats' essentially aristocratic attitudes and his association with Pound drew him towards Benito Mussolini, for whom he expressed admiration on a number of occasions. He also wrote some 'marching songs’ that were never used for General Eoin O'Duffy's Blueshirts, a quasi-fascist political movement. However, when Pablo Neruda invited him to visit Madrid in 1937, Yeats responded with a letter supporting the Republic against fascism. Yeats' politics are ambiguous: no friend of the Left or democracy, he distanced himself from Nazism and fascism in the last few years of his life. He was at the same time involved in the eugenics movement. In his later poetry and plays, Yeats wrote in a more personal vein. His subjects included his son and daughter and the experience of growing old. In the poem "The Circus Animals' Desertion," published in his final collection, Yeats describes the inspiration for these late works in the lines "Now that my ladder's gone, / I must lie down where all the ladders start / In the foul rag and bone shop of the heart." In 1929, he stayed at Thoor Ballylee for the last time. Much of the remainder of his life was outside Ireland, but he did lease a house, Riversdale in the Dublin suburb of Rathfarnham from 1932. He wrote prolifically through the final years of his life, publishing poetry, plays and prose. In 1938 he attended the Abbey for the last time to see the premier of his play Purgatory. The Autobiographies of William Butler Yeats was published that same year. After suffering from a variety of illnesses for a number of years, Yeats died at the Hôtel Idéal Séjour, in Menton, France on January 28, 1939, at age 73. The last poem he wrote was the Arthurian-themed "The Black Tower." Yeats was first buried at Roquebrune, until, in accordance with his final wish, his body was disinterred and moved to Drumecliff, County Sligo in September 1948, on the corvette Irish Macha. His grave is a famous attraction in Sligo. His epitaph, which is the final line from one of his last poems, “Under Ben Bulben” is "Cast a cold eye on life, on death; horseman, pass by!" Of this location, Yeats said, "the place that has really influenced my life most is Sligo." The town is also home to a statue and memorial building in Yeats' honor. Foster, R. F. (1996). W. B. Yeats: A Life, Vol. I: The Apprentice Mage. Oxford UP. ISBN 0192880853. Igoe, Vivien (1994). A Literary Guide to Dublin. Methuen. ISBN 0413691209. Longenbach, James (1988). Stone Cottage: Pound, Yeats, and Modernism. Oxford Univ. Press. ISBN 0195066626. Ryan, Philip B. (1998). The Lost Theatres of Dublin. The Badger Press. ISBN 0952607611. History of "William Butler Yeats"
This page was last modified on 30 July 2013, at 20:25.